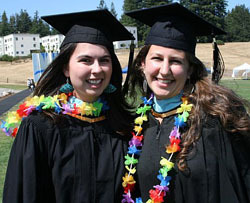 Alumni gave more than $750,000 to UCSC as part of Reunion Weekend, helping support the experiences of current students. Photo by Carolyn Lagattuta. "This level of giving is a heartwarming reflection of the strong affection and support our graduates feel for their alma mater," said Carolyn Christopherson, executive director of the UCSC Alumni Association. The total represents donations made to campus so far this year by graduates celebrating their 5- through 40-year reunions. More than 1,000 people registered to attend Reunion Weekend, the school's annual alumni celebration, which took place April 24-26. This year's gathering included special festivities to celebrate the 40th anniversary of the graduation of UCSC's pioneer class. Signature gifts this year included $250,000 for the McHenry Library expansion from alumnus and CEO of Chronicle Books Nion McEvoy (B.A. literature, Porter College, 1974), who is also a trustee of the UCSC Foundation, noted Christopherson. Another $200,000 gift came from a donor who prefers to remain anonymous. A large number of alumni donors contribute to the UCSC Library and the campus's 10 colleges, but they can direct their gifts to the area of their choice, she added. The $745,000 total is the largest amount raised since 2005, when alumna Kit Mura-smith's record-setting $1.4 million gift boosted annual alumni giving to more than $1.7 million. Mura-smith's gift was the largest single donation ever given by an alum. Mura-smith, who earned a B.A. in applied social anthropology in 1975 from Merrill College, dedicated those funds to enhancing library facilities and providing scholarships for re-entry students. So far, more than 800 donors have contributed to this fiscal year's fundraising drive, generating more than 1,025 gifts to UCSC, said Christopherson. "In the most challenging economic crisis since the 1930s, it is extraordinary to see our alumni stepping up like this," said Christopherson. "It is more than double the $350,000 we had hoped to raise. Our alumni recognize the opportunity philanthropy provides to transform lives, and their generosity greatly increases the number of people whose lives will be touched."